Before we go anywhere, here’s a full warning for readers: the contents of DC Universe Rebirth #1 will be discussed at length here. If you’ve both not read this comic and avoided spoilers for it but intend to take it in at a later date, do not go further. You’ve been warned. I can’t recall what my first DC comic was. It was probably some random early 90’s Batman or Superman comic, but the specifics are uncertain. That said, I can remember the four stories that really got me hooked on DC. All of them hit me at some point between the ages of 8 and 11 and were connected by a central theme: legacy. Don’t get me wrong, that’s not why I loved them. That was because I was a kid and those stories were mind blowing to me. But looking back on it now, it’s interesting how important legacy was to each story. Terminal Velocity was my favorite of the four for a bevy of reasons – being written by Mark Waid and drawn by Salvador Larocca, Carlos Pacheco and Mike Wieringo helps a lot – but maybe the biggest was that The Flash was (and is) my favorite superhero and Wally West is my Flash (unless you count Bart Allen, although I preferred him as Impulse). There was just something wonderfully human and hopeful about Wally. He was, in many ways, a proxy for the readers. He was a guy who loved The Flash and became lucky enough to become him, which is something I’ve thought of way too many times in my life. He was even the first Flash to make his identity public, and when you combined that with his generally healthy personal life, it helped make him feel even more like a regular guy. We could relate to him in a way we never could other DC characters, really, as they were always designed as gods, not people. For all those reasons and more, to me, Wally West felt like the heart of DC Comics. Both the Wally West we knew and the legacy of DC’s heroes went away (for the most part) with The New 52, before returning this past week in DC Universe Rebirth #1 by Geoff Johns, Gary Frank, Ethan Van Sciver, Ivan Reis, Phil Jimenez and more. Based off of everything I just walked you through, you’d probably think, “man, I bet David was excited to read that comic.” I was, truly speaking. Even without knowing Wally was returning, everything I had heard about Rebirth excited me in a way DC comics hadn’t since, well, The New 52 launched. I was fully onboard, even going out of my way to avoid all spoilers before the comic arrived. It was a comic I could barely wait for, and instead of picking it up after work and reading it that night like most comics, I bought and read it during my lunch at work. It was time. I was ready for anything, but most of all, I was open and ready for it to reignite the flames of my love for DC Comics. What I was met with was a lengthy exercise in promoting what’s next instead of building it and shifting blame rather than owning it. In short, I was met with disappointment. That could partially be on me. With great expectations comes great potential for failure, and mine were sky high. While I missed spoilers, I’d seen tweets and headlines that made this seem like the second coming. “Best DC comic in 15 years,” some exclaimed, while others touted it as a true game changer. Beyond that, Johns’ promotional tour was stirring to me. While he’s a skilled writer, like Wally West, maybe Johns’ greatest attribute as a leader at DC is how relatable he is. He just seems like someone who really loves comics. His hype became my hype. But the reality of the comic is it’s a swollen beast, although not one without positives to it. For the most part, the artists involved excelled. Phil Jimenez and Gary Frank, in particular, carried the weight of the book well. Frank’s always been one of my favorite superhero artists, as he’s exceptional at realizing both the bombastic and the personal. The section he worked on featuring Ted Kord and Jaime Reyes – Blue Beetles, both – was a highlight at least in part because of how well he brought Kord’s aw shucks energy to life. Jimenez had the toughest act to live up to – he had the big Barry/Wally moment – but he brought emotion and power to it, while elegantly baking in visual reference elsewhere to famous scenes of Flash lore. Van Sciver and Reis were solid as well – I particularly enjoyed the opening page and its homage to what was set to come at the end by Van Sciver – but to me, Frank and Jimenez were the highlights. 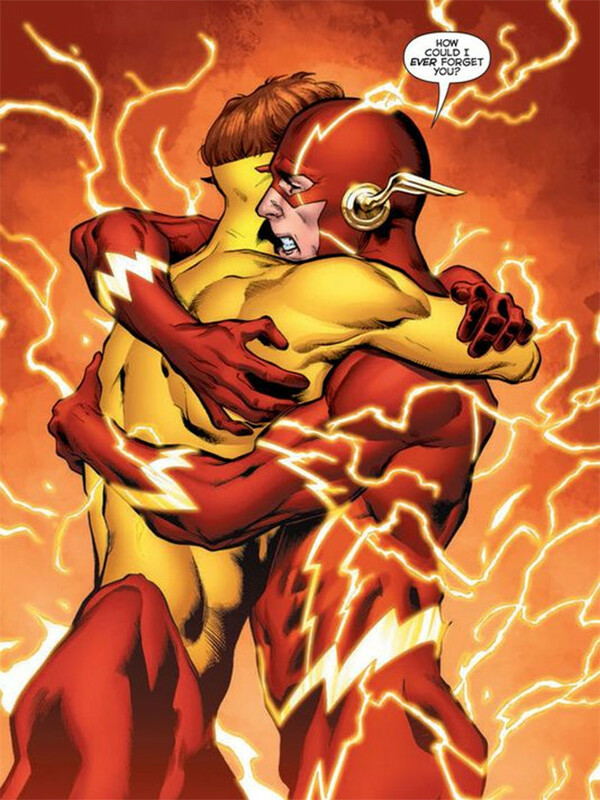 And the central thread of the story being Wally West was, for the most part, emotionally resonant and fitting. As suggested earlier, Wally’s the heart of DC Comics, and bringing him back and making him the manifestation of the hope they’re attempting to resuscitate in DC’s titles was a savvy, clever move. 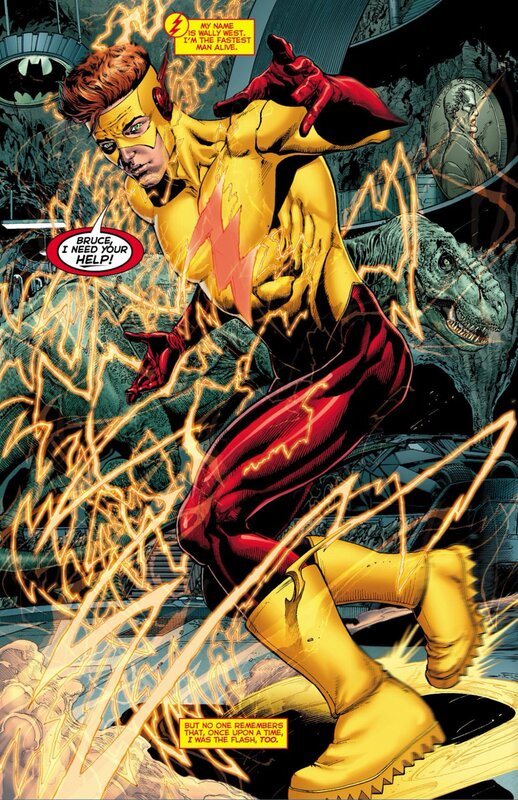 The arc of Wally in this issue was one that worked – he was trying to find a conduit to bring him back from the Speed Force – and if it didn’t, the entire issue would have crumbled because of it. Structurally, it was sound, and at times – particularly when Barry helped him come back to life – it was impactful. But the execution left something to be desired. We all know Johns loves his personal character narration as a structure to build these big issues around. We’ve seen it time and time again in the past, and this issue is no different. And while the character moments soared at times for Wally, his narration was hamfisted, operating as a crutch of convenience for the entire story. Even worse was how Wally’s quest effectively just made him our guide to the introduction of what’s next in the DC universe, making DC Universe Rebirth #1 less of a story of itself and more of a teaser. It was like paying to see a movie, sitting down with your tub of popcorn and drink, and getting a trailer for the movie you thought you were going to watch. That aligns with my greatest problem with the issue, and no, it isn’t what you think. For a comic that was hyped and designed as the introduction to a more hopeful version of the DC universe, one that left everything we didn’t like about the New 52 behind, I have to ask: what really changed? Wally is back. There’s one Legion member hanging out in a police station. Johnny Thunder has been tasked with bringing the Justice Society back (if he can get out of his rest home). Batman has a letter from his dad. There’s three Jokers, I guess. Superman’s a lumberjack (and a whole different world’s Superman). Aquaman and Mera are engaged (presuming she said yes). But they’re all the same characters, besides the reintroduction of Wally and the official arrival of this other Superman. Everything here could have (and maybe has been) covered elsewhere, and beyond that, most of these elements are plot points, not character turns. If there’s any tonal shift in the future of DC Comics – as the heads of DC have constantly touted – it has little to do with the events of this book and more to do with a conscious effort by DC editorial and its creative teams to make that happen. This was meant to be the reawakening of hope for DC Comics, but instead, we were given a clip reel driven by a deus ex machina. It’s inorganic, and gives this issue an air of being inconsequential as a whole. It’s not a good look for a comic that’s meant to be the guiding light for a new era of DC, even if comic readers have been trained to be suspicious of such things. If DC’s tone does shift, it’s because of a choice the team is making, nothing else. Just like Watchmen – a comic built to deconstruct superheroes, not provide a blueprint on how they should be told – wasn’t to blame for DC making its comics dark and unenjoyable. And as much as Rebirth was a weak effort in establishing any reason for its pending sunnier disposition, pinning the characters Alan Moore and Dave Gibbons created in 1986 as the driver for its darkness was even more uninspired. It was a weird move at best, hackneyed meta-commentary at worst, and troubling passing of the buck no matter how it plays out. It’s the ultimate eff you to Moore, further cheapening a well-loved story by deploying its most powerful figure as the bogeyman that’s behind the bad times. The problem is, it is, and it always was. The twist at the end of this issue reminded me of last year’s Bond movie, Spectre. Like Rebirth, it was a bloated narrative with an overarching villain shoehorned in. 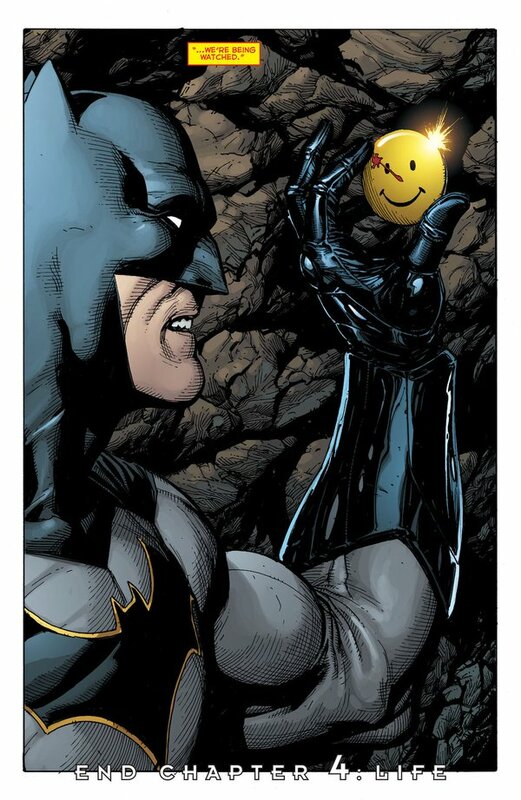 But instead of Christoph Waltz’s metaphorical mustache twirler declaring himself the architect of all of DC’s pain, this time, it’s Johns’ using Watchmen as a stand-in. The greatest commonality both of these stories have is that neither villain was built organically. They were masterminds simply because the creators said they were. Nothing was earned, and because of that, the point felt flat. As a single issue, the DC Universe Special is neither egregiously bad or triumphantly good. It just is. It’s more of a collection of unrelated events tethered by a central thread leading into an ending that felt like the comic book equivalent of a photo bombing. The narration was rough at times, but it did lead to some emotionally resonant moments. The art was good, but as DC tends to do, somehow they made even it feel secondary by weaving multiple artists into each clearly delineated section. It even failed at the start as an issue designed to reinvigorate the flames of lapsed readers like myself and intrigue new readers by opening with a suggestion that just reading this wouldn’t be good enough: you should really read two other comics first. The biggest problem with this comic isn’t its failures as a story – of which there were many – but how lacking it was in its true objective: an 80-page mission statement. Everything about the comic was in conflict with itself, revealing that even in peace time, DC Comics is at war. With its past. Its mixed objectives. Hell, even its own identity. 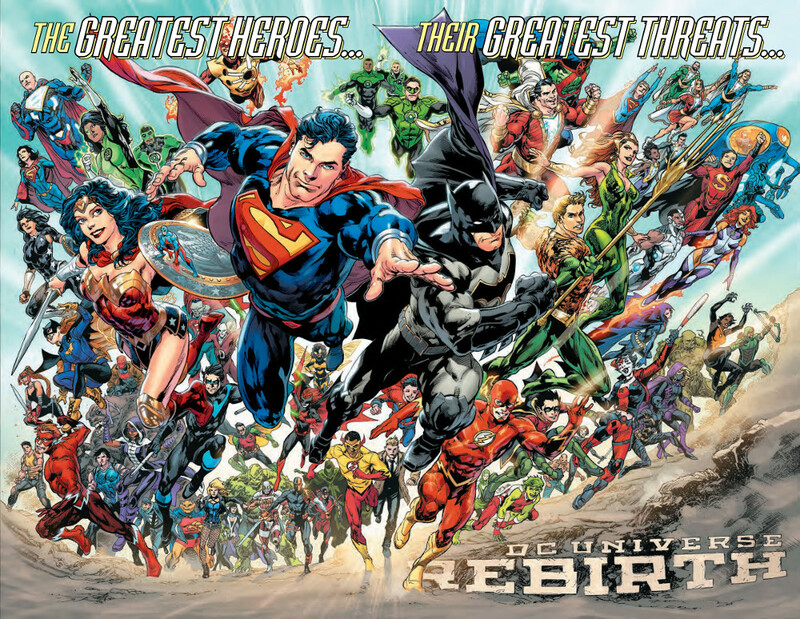 Ultimately, DC Universe Rebirth was a hard comic for me to read – and I did read it, several times even – because of the struggles DC has with itself. No matter how hard they try to pin their problems on a comic they own the rights to, it’s hard for me to forget that DC’s greatest enemy has been themselves the whole time. DC Universe Rebirth #1 gives me little confidence that we’ll see that change any time soon.